Planning a school and its campus layout requires depicting the premises, representing internal spaces, their dimensions, the location of windows and direction of natural light. Detailed classroom seating chart helps you visualize the location of the desks and blackboard, taking into account the specifics of the room and its lighting, with a goal to design a classroom to be comfortable for each pupil and teacher. The schoolroom is a premise where children spend the most part of their day and its atmosphere directly affects not only the learning process and mood at the moment, but also the future professional and life choices. The classrooms equipped professionally, with taste and love give an impulse for easy assimilation of new material, instill the children's love for working and studying, assist in developing their talents and abilities. Usually, the schoolrooms for high school students are made in restrained colors, while making the classrooms for kids there are used brighter colors and decorations on the educational thematic made in a fun form. The specialized rooms of informatics, chemistry, physics, physical training and some others are designed taking into account their thematic features, with equipping them with the corresponding special equipment and devices. Besides the school facilities, there exist many other educational institutions and centers — the educational centers for preschool children, lecture halls in universities, institutes, colleges, conference rooms, IT educational centers, seminar rooms, training centers and many other educational buildings, which planning and proper equipment has great importance. The designers of these premises need to think all through the small details, starting with the lighting and ending by the room's filling with necessary furniture and accessories, as well as special equipment, such as audio-video equipment, speakers, screens, projectors, etc. All ideas and thoughts are easy to illustrate and to depict in a form of professionally drawn plans. At the same time, if the bookcases and boards are usually located near the walls, the arrangement of desks in specific classrooms enables some freedom and deviation from the strict position in a form of columns for the purpose to easier the communication in small groups, in cases when it is necessary. School and Training Plans solution enhances ConceptDraw DIAGRAM functionality with extensive drawing tools, numerous samples and examples, templates and libraries of classroom design elements for quick and professional drawing the School and Training plans, School Floor plans, Classroom Layout, Classroom Seating chart, Lecture Room plans of any complexity. The range of applications of the program is huge — from the planning the classrooms for kids in preschools, schools and colleges to the lecture halls in universities, conference rooms and even large conference halls. Each offered classroom seating chart template is your real help in drawing Classroom Seating charts and Training Room layouts. ConceptDraw DIAGRAM classroom layout and classroom seating chart maker is incredibly useful for builders, designers, engineers, constructors, as well as teaching personnel and other teaching-related people. There are 8 stencil libraries containing 294 objects for School and Training Plans solution. There are a few samples that you see on this page which were created in the ConceptDraw DIAGRAM application by using the School and Training Plans solution. Some of the solution's capabilities as well as the professional results which you can achieve are all demonstrated here on this page. All source documents are vector graphic documents which are always available for modifying, reviewing and/or converting to many different formats, such as MS PowerPoint, PDF file, MS Visio, and many other graphic ones from the ConceptDraw Solution Park or ConceptDraw STORE. The School and Training Plans solution is available to all ConceptDraw DIAGRAM users to get installed and used while working in the ConceptDraw DIAGRAM diagramming and drawing software. This diagram was created in ConceptDraw DIAGRAM using the combination of libraries from the School and Training Plans Solution. An experienced user spent 5 minutes creating this sample. This sample shows a classroom layout plan. It is a detailed plan showing the placement of the school furniture and educational equipment — student desks, teacher table, chalkboard and wardrobes in the classroom. The classrooms intended for the teaching and learning activities, can be found in any educational institutions, but the selection of furniture, its type and layout can greatly differ from each other, even in different classrooms within one building. The student desks in a given classroom are placed in an interesting form of a semicircle in three rows that looks compact, comfortable and quite extraordinary. There are selected the single desks for this classroom, they provide a comfort work of each single student and so nobody can distract its attention from the subject's study. Design your own classroom plan for school, private school, home school, college, university, or other educational institution in a flash with School and Training Plans Solution. This diagram was created in ConceptDraw DIAGRAM using the combination of libraries from the School and Training Plans Solution. An experienced user spent 15 minutes creating this sample. This floor plan sample shows a classroom with a lot of equipment. In addition to the tables, chairs, open bookshelves, white board that are familiar and commonly found in the classrooms, you can also notice a screen, TV conference system, and specially equipped places — PC desks and printer stand, so this class is great for computer science, programming, as well as performing tasks or control tests in electronic form, for printing the presentation materials or showing slides directly on the screen using the corresponding output equipment. The arrangement of the meeting tables in the middle of the room is convenient for work in a group and for active discussions. The ConceptDraw DIAGRAM software enhanced with the School and Training Plans Solution tools, is a professional classroom seating chart maker. Use the tools to draw the plans of the premises, to mark the sizes and layout places of predesigned furniture elements from the libraries. This sample illustrates the floor plan of a creative classroom. Design of a creative classroom is limited only by your imagination. It’s a place which should contribute to the development of creativity in children, inspire on the creativity, provoke the appearance of a huge number of exceptional ideas, the interest and desire to produce, to make personal and to develop themselves, to make decisions. Here are developed and encouraged such qualities as independence and involvement. It’s very important to pay attention to the comfort and convenience of pupils in laying out the plan for this classroom. All furniture and appliances need to be chosen according to the established security measures for the child educational institutions and child entertainment centers. The space is visually divided into the zones of interest — art corner, sand and water area, library corner, listening area, computer area, block corner, cooking area, house corner and space with table toys. This sample shows a detailed floor plan of a large lecture hall, named also a lecture theater. Such auditoriums are usually represented in the educational institutions, buildings of universities, institutes, colleges and are used for simultaneous teaching a large number of students. The capacity of this hall is huge. Near the main room, there are several additional rooms — projector room, cloak room, reception, restroom. The lecture hall floor plans and the classroom seating charts, designed in ConceptDraw DIAGRAM, let you easily see the size of the lecture hall, the convenience of location, and what needs to change. The classroom seating chart you see is a classic view of the seating arrangements in the lecture hall. Typically, the lecture hall has a pitched form of the floor that allows each new row to sit above the previous one and, accordingly, all students can see the lecturer and the board well. This diagram was created in ConceptDraw DIAGRAM using the combination of libraries from the School and Training Plans Solution. An experienced user spent 10 minutes creating this sample. This example demonstrates a seating chart for a training classroom. It depicts the educational equipment and furniture layout on the plan of an educational premise. For varied kinds of educational institutions and different types of lessons, varied and sometimes specific kinds of classrooms and auditoriums are required, this allows the educational process to pass as efficiently as possible. The differences begin from the size of the room accordingly to the quantity of pupils and finish by the differences typical for the specific lessons, such as the computer classrooms and laboratories. Being included into the ConceptDraw's School and Training Plans Solution, this classroom seating plan can be used as is or as the base for creating your own school floor plans for public or private schools, high school floor plans, classroom designs, schoolroom layouts, lecture hall plans and other educational auditoriums floor plans. You can add the details, move the desks and furniture as you see fit. 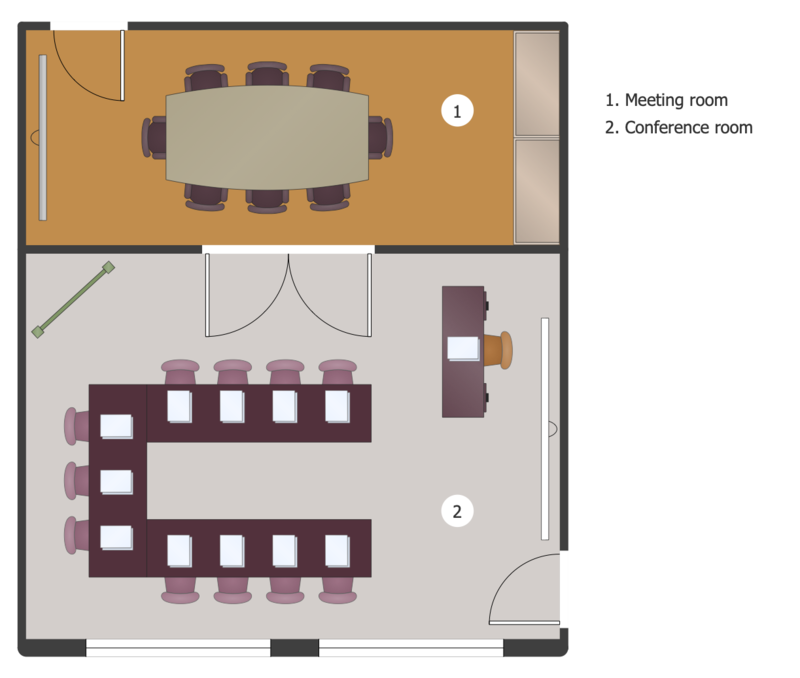 This sample illustrates the conference rooms floor plan and the furniture layout on it. There are represented two adjacent rooms — meeting room and conference room, which are used for providing the singular events, the business conferences and meetings. The rooms are designed for a comfortable being different number of people and contain a diverse set of furniture, but at the same time there are some similarities — they both include tables, chairs, and boards. When the doors are tightly closed, these rooms are perfectly isolated from each other, this assists in keeping the confidentiality of the conversation, very often it is necessary for the business meetings. Add the notes, explanations, notations, comments nearby to the diagram, make them in a form of a legend to present your plan in the most complete and understandable way. You can make several plans of your conference room or even a large conference hall without efforts, and then choose the best of them. This floor plan sample demonstrates the equipment and furniture layout on the plan of the building intended for IT training. There are several IT teaching classes at this institution, all they are equipped with computers and other devices, such as printers. No one educational institution cannot exist without additional and utility rooms, such as the lavatory, dining room, rest area. On the presented floor plan these additional facilities are also present and reasonably equipped for a comfortable staying of students in the walls of this educational institution. The well-planned working space and perfectly equipped workplaces contribute for better perception of information that is very important during the training process. Pay sufficient attention to planning when arranging the IT class and ConceptDraw DIAGRAM software enhanced with School and Training Plans Solution will help you to display your plan on the screen as quickly as possible, at this easy and professionally. This sample represents the lecture center furniture and equipment layout. The lecture halls are specific premises where typically pass the educational lectures. They are large, capacious, sufficiently universal and can be used both for the usual lectures and for the conduction the seminars with great persons, scientists, professors, etc., as well as for organizing presentations, meetings, conferences on different thematic. Two lecture halls, represented on this sample, are identical in sizes and provide approximately equal furniture filling, but demonstrate diverse arrangement of tables with chairs. The lecture hall is a great place to focus a large number of people on the lecturer's speech or the audio-visual presentation. Typically, the modern lecture halls are equipped with special audio-visual equipment, projectors, screens, acoustic equipment, loudspeakers, microphones, and others. If the planned hall includes all this equipment, you can mark all it on your plan using the corresponding vector shapes from the libraries of ConceptDraw Solution Park. This sample illustrates the seminar rooms seating plan. You can observe two rooms, one slightly larger than another. But what is the fundamental difference between them? Of course, it is the atmosphere and format created for the communication, which begins with the room planning and furniture layout. The first room we observe, represents a clear and strict arrangement of desks, another one is more free style and flexible, there are smoothed corners and green plants. The first room involves an official atmosphere and the second room looks more favorable, it possesses for informal and "live" conversation. The main purpose of the seminar is to discuss some specific issues in a small group of people, at this discussion requires an active participation of all participants. And how do you see the hall for the seminar or training? ConceptDraw DIAGRAM will help to display anyone, even the most daring of your plan with ease and simplicity. This diagram was created in ConceptDraw DIAGRAM using the combination of libraries from the School and Training Plans Solution. An experienced user spent 20 minutes creating this sample. This sample represents the floor plan of the training center. This training center learning space design plan depicts the lecture hall seating plan, the classroom furniture and educational equipment layout, the placement of lobby and community room, elevator, entrance and emergency exit, catering kitchen and toilet appliances. The main part of the center's space is occupied by a lecture room, where the teaching and learning processes occur. This training center perfectly suits for lectures, seminars, trainings, round table meetings, discussions, conferences on absolutely different subjects. Depending on the number of people and the type of event, you may need to change the furniture arrangement. Think over the alternative variants for different cases and easily sketch them on your plan. Present them separately or make a collage, demonstrate on the screen, send by e-mail or print, all you like you can do with ConceptDraw DIAGRAM software and School and Training Plans solution tools. Both ConceptDraw DIAGRAM diagramming and drawing software and the School and Training Plans solution can help creating the floor plans you need. The School and Training Plans solution can be found in the Building Plans area of ConceptDraw STORE application that can be downloaded from this site. Make sure that both ConceptDraw DIAGRAM and ConceptDraw STORE applications are installed on your computer before you get started. After ConceptDraw STORE and ConceptDraw DIAGRAM are downloaded and installed, you can install the School and Training Plans solution from the ConceptDraw STORE. To make sure that you are doing it all right, use the pre-designed symbols from the stencil libraries from the solution to make your drawings look smart and professional. Also, the pre-made examples from this solution can be used as drafts so your own drawings can be based on them. Using the samples, you can always change their structures, colors and data.